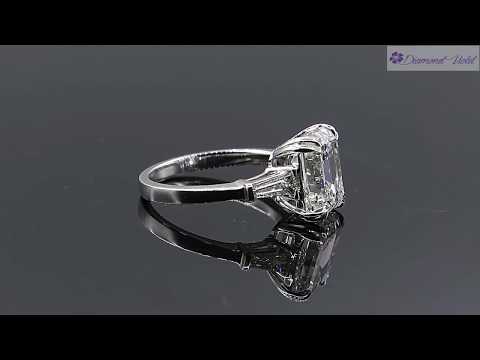 A Breathtaking Estate Vintage HANDMADE PLATINUM (stamped) Engagement ring dazzles GIA certified 5.02ct Emerald Diamond center diamond in J color SI2 clarity (Near COLORLESS and Eye clear); with measurements of 10.42x8.67x6.00mm. It is set with 2 Step cut Tapered Baguette side Diamonds; estimated total weight is 0.60ct; H-I color and VS clarity over all. The band tapers from 1.67mm to 2.20mm on the bottom. Finger size 7 3/4, can be re-sized. We offer FREE sizing with purchase. The weight of the ring is 6.40grams, nice and SOLID. Sits medium from the top of the finger, approx 6.56mm.